I would highly suggest you leave this page at once. I know, I know! They look colorful and they have a lovely name but, please, go find yourself a peaceful pattern. These are troublesome little things, they get into everything! You don't want to make one. Trust me. I see you are still reading this page. I'm trying to warn you! Okay, you need proof. 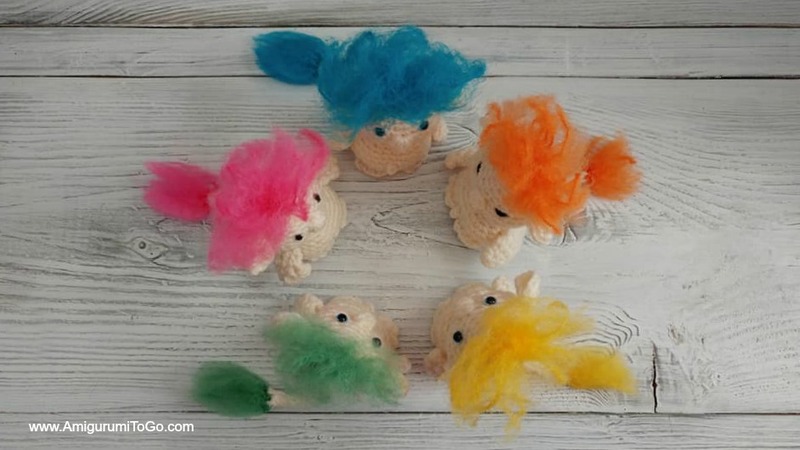 Here's just a few examples of what I go through since I've made these Spring Trolls. dry. They slobber in the sugar bowl! Gross. They run around inside the flower pots just to kick the dirt out! I'm constantly sweeping floors. It makes me tired just thinking about it. They crawl under throw rugs just to make a mess of them. This drives me insane! I'm forever straightening them out. They make knots in all my yarn balls, on purpose! Why do they do this? Why?! There's more to tell you, lots more, but I'm too busy right now untangling my yarn. Just trust me, go away, forget about these trolls. Oh my. You are a risk taker indeed. You are insisting on making a Spring Troll even after all the things I've told you? Fine. Crochet one at your own risk. Scroll down this page for the pattern. There's a green print friendly button at the bottom of this page. Enjoy... while you still can! Any color for the hair, use a type of yarn that can be brushed such as acrylic or pure wool. Use any size eyes you wish, I used a 7.5mm for the ones pictured. 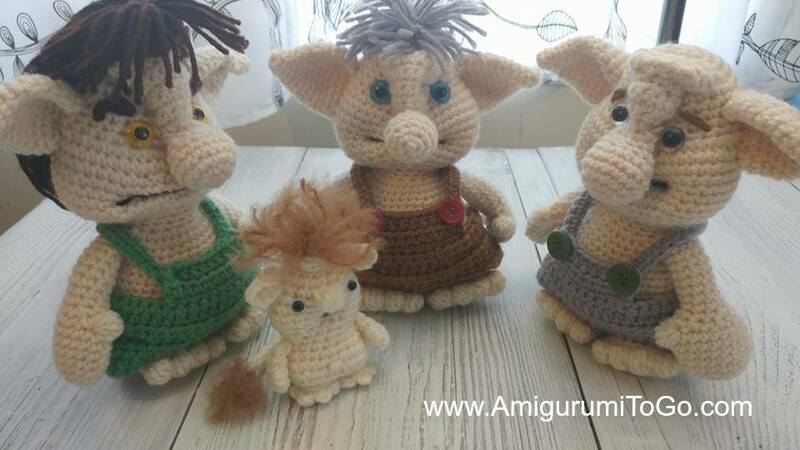 I also wrapped yarn to make some of the eyes pictured. *Make the ears first, you can sew these on before you stuff the head. 2) 2sc in each (12) Work the starting yarn tail into this row by crocheting around it. 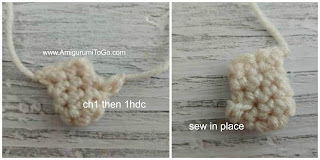 fold in half and crochet through both sides one time to hold the ear together. tip ~ begin with a long starting yarn tail. You can use this to make the thumb. 5) 1sc through both sides across the top of the arm to close it. f/o leaving a tail for sewing. Sew these on after the body has been stuffed and closed. 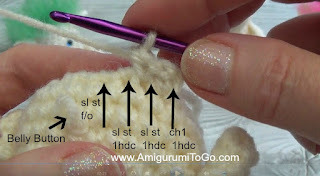 insert yarn in between rows 2 and 3, or pull the starting yarn tail through, ch1 then 1hdc in the same space. f/o and sew the thumb down. Make sure you do left and right so that the thumbs are pointing in the right direction once the arms are sewn on. Make an i-cord about 3 inches long. Pull about 7 strands of colored yarn through the end of the cord, this gives you 14 strands. Double knot each one, pull the knots tight. Trim up to about 2 inches long. Unravel each strand and split them. Brush to make frizzy. Set the tail aside. Put the safety eyes in between the 6th and 7th row with 3 visible stitch holes between them. Add a nose. Insert your hook in between the 6th and 7th row, go under the 7th row and out in between the 7th and 8th row. Pull the yarn through and chain 1. Make a bobble stitch with 5dc. Go under the 7th row, the same direction my hook is pictured, each time you pull the yarn through. If you need help with this part, please see this video, fast forward to 5:27. 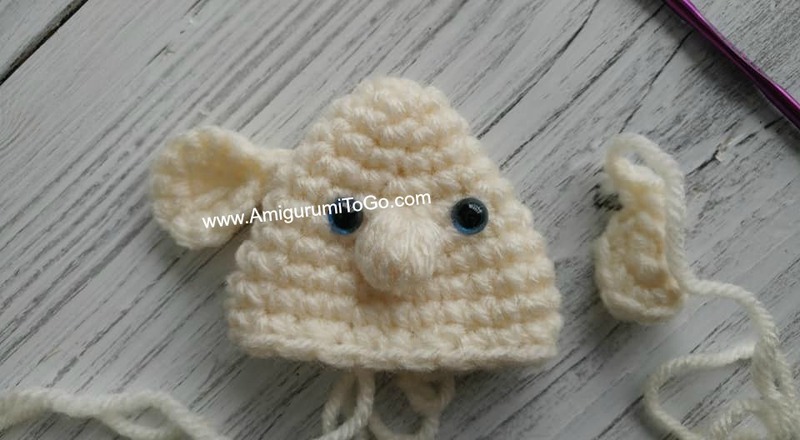 It's another pattern of mine but the nose is done the same way. Sew the ears on. Flatten the head out like pictured below, make sure the nose is center, the ears go on each side of the head, sewn over row 5.
stuff head, shape as you stuff. stuff the majority of the body. You will put more stuffing in before you close the body up. f/o leaving a long tail for closing up the gap and for making a line for the bum, making the belly button, and indent for the mouth. Follow the steps in order below. 1) weave in and out of the remaining stitches. Before pulling tight to close up the gap, add in stuffing as needed. Once fully stuffed, pull the yarn tail tight to close the gap and knot off. 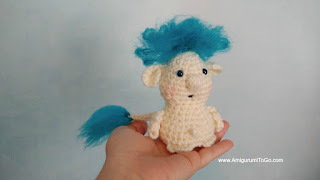 2) bring the yarn tail through the body and out the backside of the troll's bottom half, in between rows 15 and 16. Wrapping the yarn tail over the bum and back into the body though the center hole of the last row and then back out in between rows 15 and 16. Pull tight creating a split for the bum. Knot off. 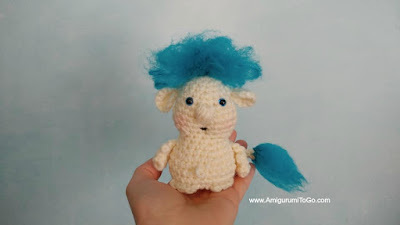 3) bring the yarn tail out through the the troll's belly, in between rows 17 and 18. Make a French knot to make a belly button. Wrap the yarn tail around the tip of the yarn needle 3 or 4 times then go through the trolls body, a stitch over from where you came through, and come out through the back of the neck. 4) bring the yarn tail through the head and out where the mouth will go, in between the 10th and 11th row, wrap over a stitch post and then go through the head coming out through the back of the neck. Pull tight to create an indent for the mouth. 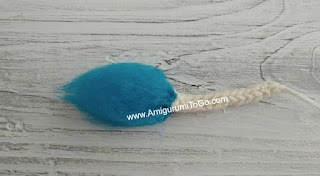 Knot off and hide yarn tail inside head. 5) bring a black yarn tail through the head and out where you made the indent for the mouth. Wrap over a stitch post then back through the head coming out the same stitch hole you went into. You might have to wrap twice to make the mouth visible. 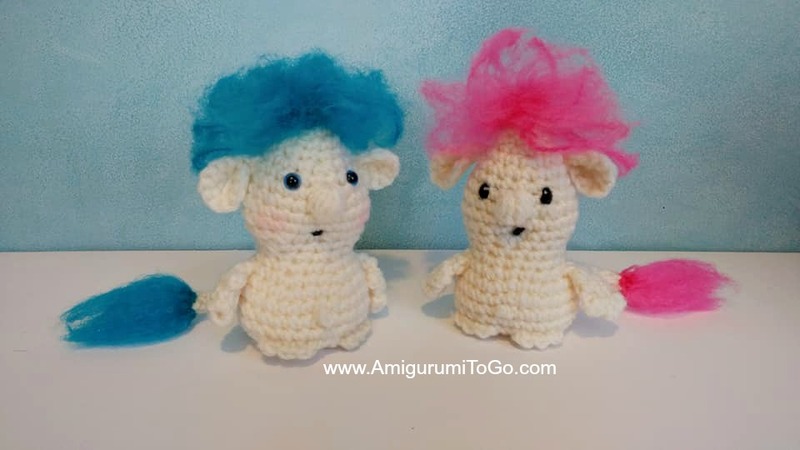 Knot off yarn tails and hide knot inside head. 6) sew the arms on. I sew them on a slant with the top corner on row 15 and the bottom on row 16. 7) add the first set of toes. Toes are crocheted over row 20. Turn the doll upside down, insert your hook as pictured. 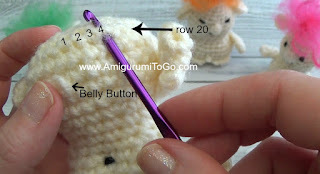 Count 4 stitch holes to the right of the belly button, insert your hook under row 20 and pull the yarn through. ch1, in the same space add 1hdc. In the next space to the left, sl st, in the same space add 1hdc, in the next space to the left, sl st, in the same space add 1hdc, in the next space to the left, sl st and f/o. Knot off each yarn tail then hide them inside the body. 8) Repeat the same steps for the other side but start in the first stitch hole next to the belly button and work to the left. 9) Add the hair. cut a bundle of yarn in any color. Add about 7 strands to the ring of row 1 then add about 8 or 9 more to the stitch posts in between row 1 and row 2. Trim to about 3 inches. Unravel each strand and split them. Brush the hair until all frizzed out. Style. 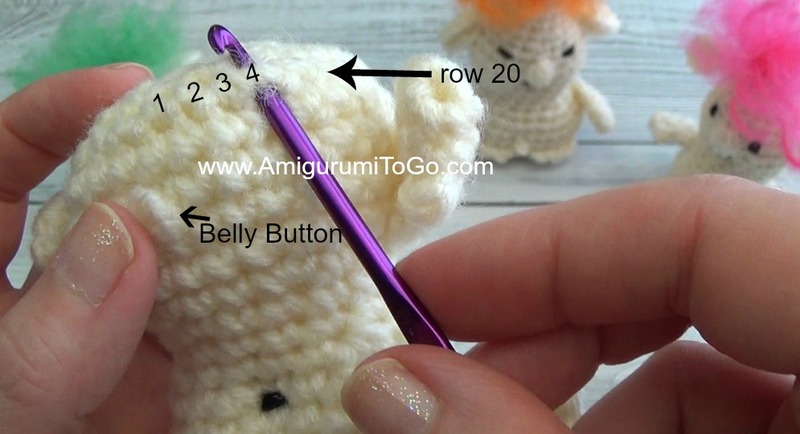 10) Sew tail to the top of the bum. I hope you enjoyed this pattern. You will regret your decision to make one unless you go Troll proof your house. Hurry! There is no green print friendly button. I did save the link though and shared it on my page. Thank you, as always I love the stories you come up with!